The Honda CB500 is a first big motorcycle you’ll never want to sell. It’s huge fun because it’s so confidence-inspiring, meaning you can take it anywhere and it’ll make you feel you can push your limits. 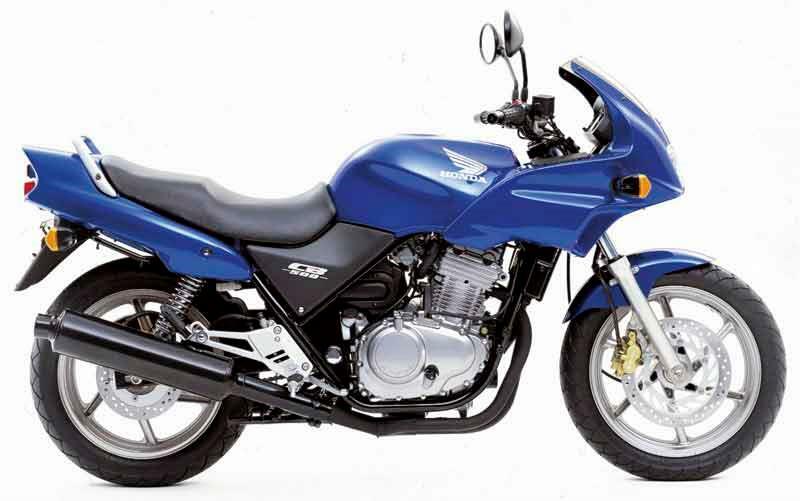 Very competent: commuters and couriers love Honda CB500s for their reliability and all-round, top-notch performance. In all aspects, the Honda CB500's a winner. Everything is stable and friendly, meaning the rider can hone their skills whilst chucking the Honda CB500 about with wild abandon. It’s comfortable, the suspension’s ok, the gearbox is smooth and both slow and high speed handling are excellent. Very versatile, the Honda CB500 will cruise up to 90mph on the motorway without a fairing. 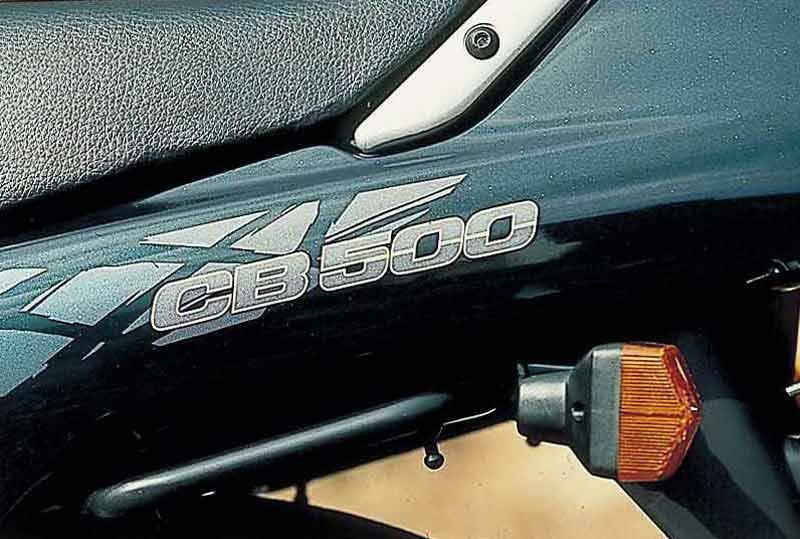 The Honda CB500 motor’s incredibly smooth with loads of power across a broad range. 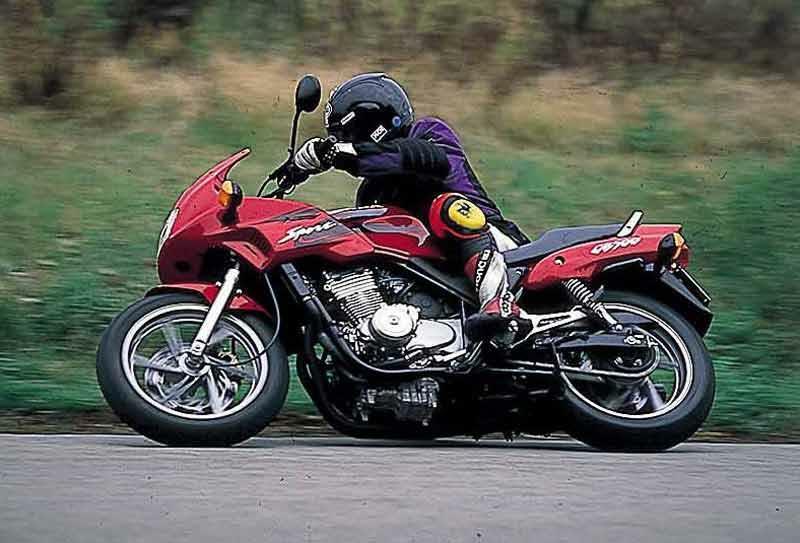 Even more fun… There’s an unexpected surge of welly, just after 8000rpm, which makes the Honda CB500 take off. Power delivery’s clean from a responsive throttle. Furthermore, the Honda CB500's very reliable and you can rack up the miles with little care. So good, we almost need a fanfare. Honda CB500 engines go on and on and on, as many a courier will tell you. Weaker points are the easily-rusting downpipes and short-lived exhausts. Otherwise, the Honda CB500 is pretty damned good: far more refined, and with far more longevity, than its rivals (see below). Excellent. The Honda CB500 is a hugely versatile machine that’ll surprise you with its ability. Competitors, such as the old Kawasaki ER-5 or Suzuki’s GS500E, may be slightly cheaper but don’t have the quality (or the extra horsepower) of the Honda CB500. 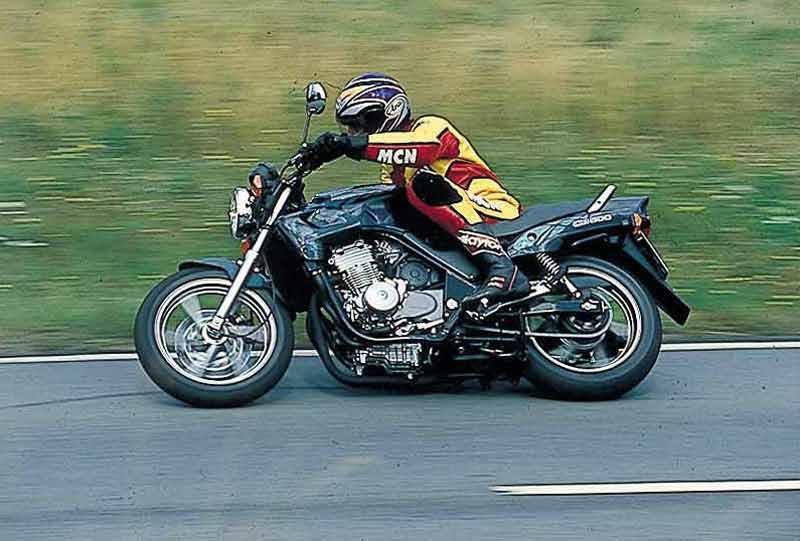 Be wary of ex-training school/race bikes (the Honda CB500 had its own series!) which have been dropped/crashed a lot. Find a Honda CB500 for sale. Nothing too flash (the money went on the Honda CB500's chassis and the engine) just well-thought-out and well built. The Brembo brakes work wonders. 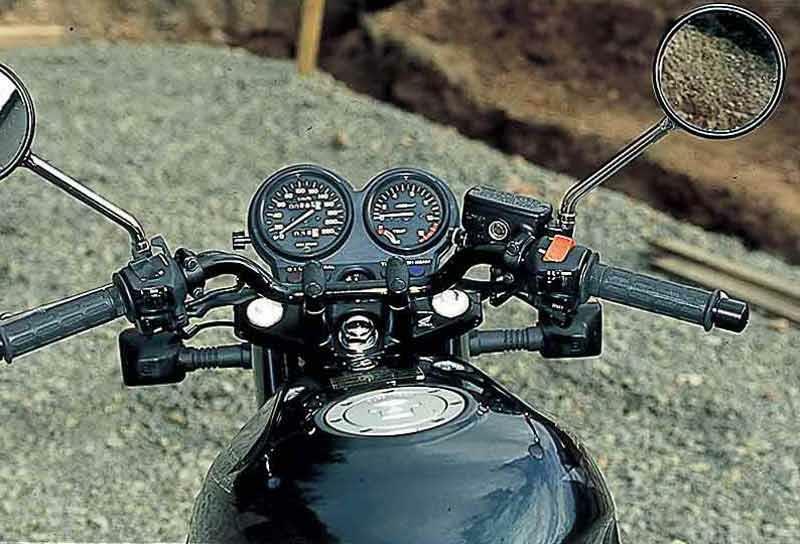 The Honda CB500 clocks are large and clear but very basic. A good seat with a decent amount of room for a pillion, too; and there’s a grabrail. Comfort’s good overall on the Honda CB500 but it can be cramped for giant riders. 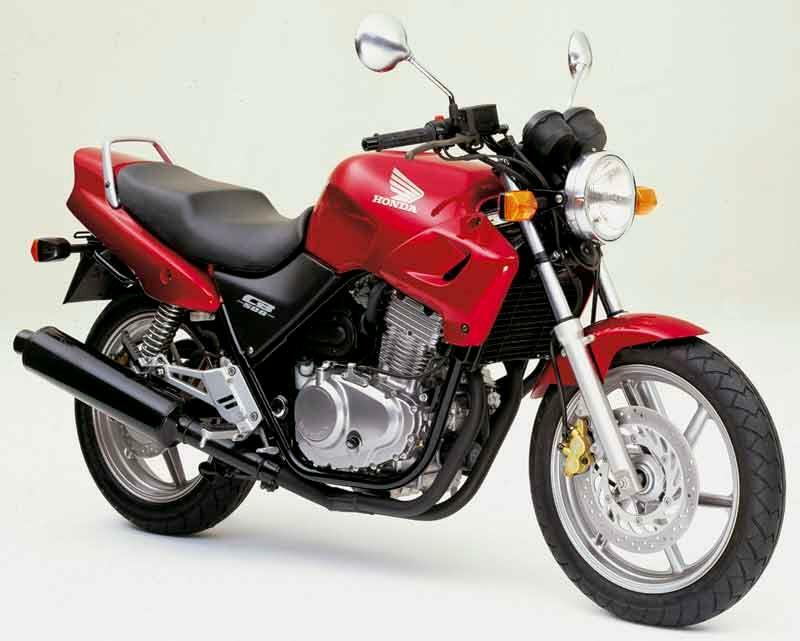 1994: Honda CB500 launched. It had a drum brake at the rear and Nissin caliper up front. Naked version only available. 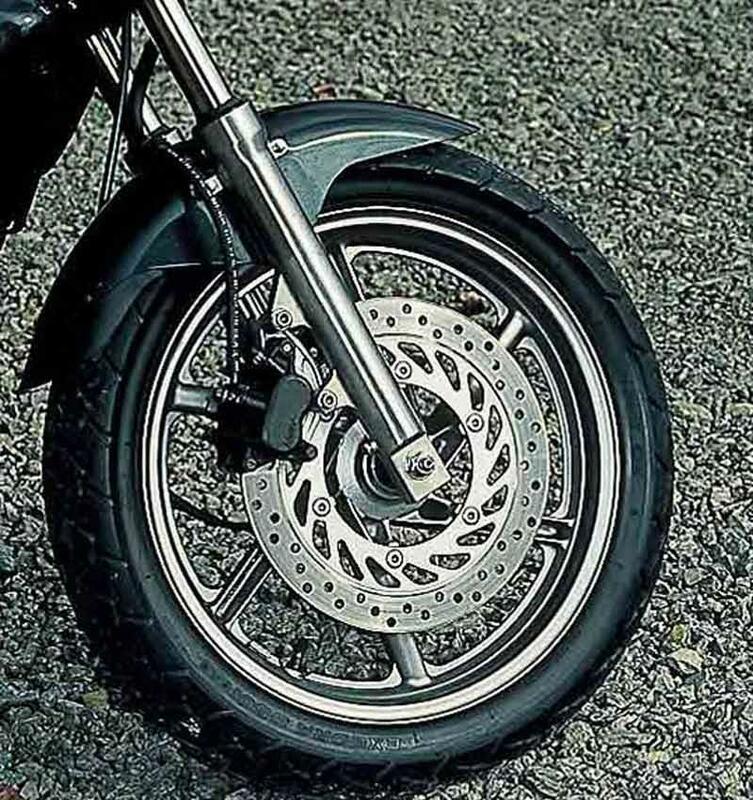 1997: The rear brake converts to disc and both brakes get Brembo calipers. 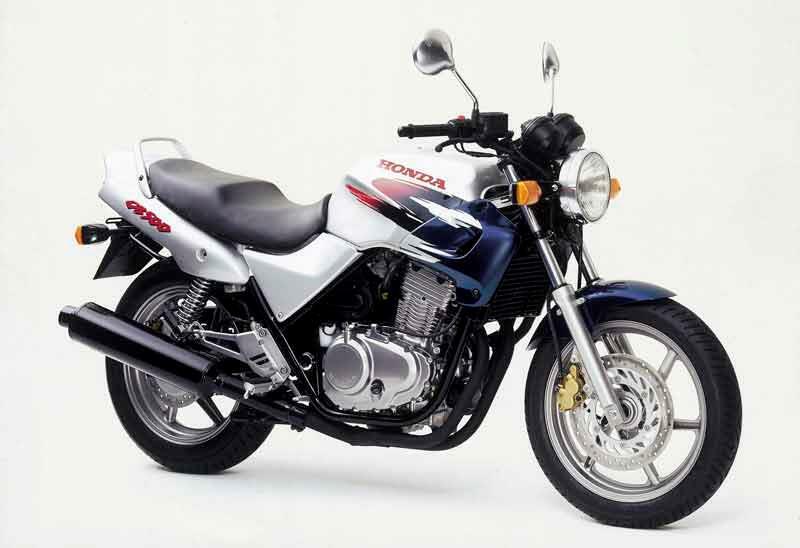 1998: Honda CB500 race series kicks off and a silver version of the bike becomes available to celebrate. A half-faired Honda CB500S version joins the Honda fleet. 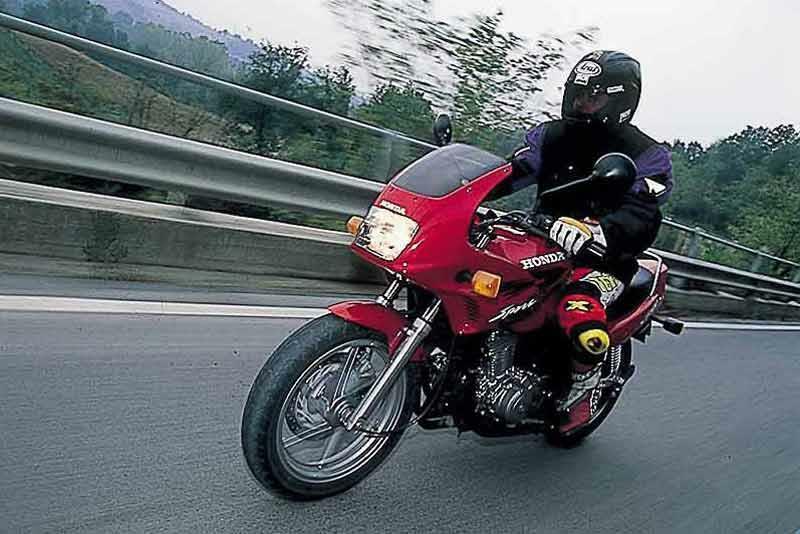 2003: Both Honda CB500 models discontinued as they didn’t meet EU emissions laws. Replaced by the Honda CBF500. 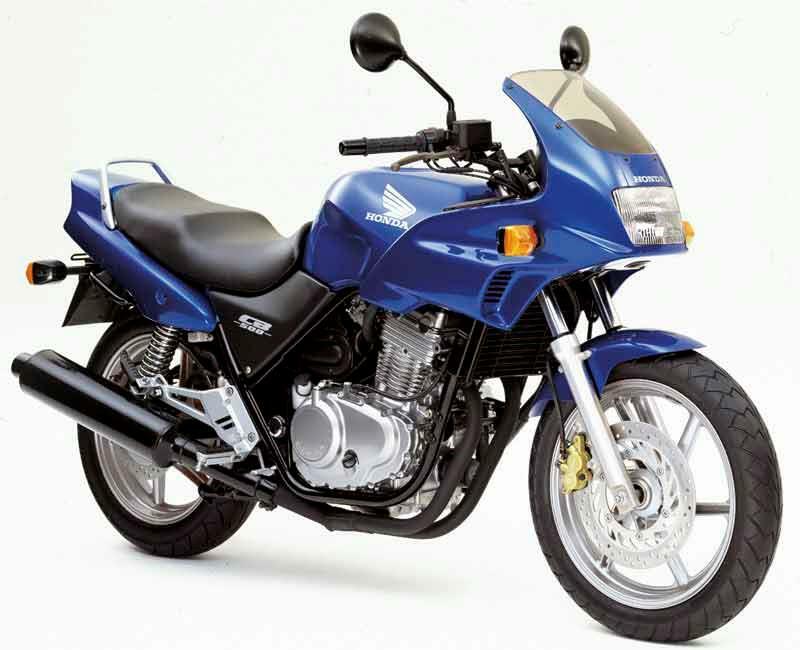 CB500S: half faired version of the Honda CB500, introduced in 1998 and discontinued in 2003. 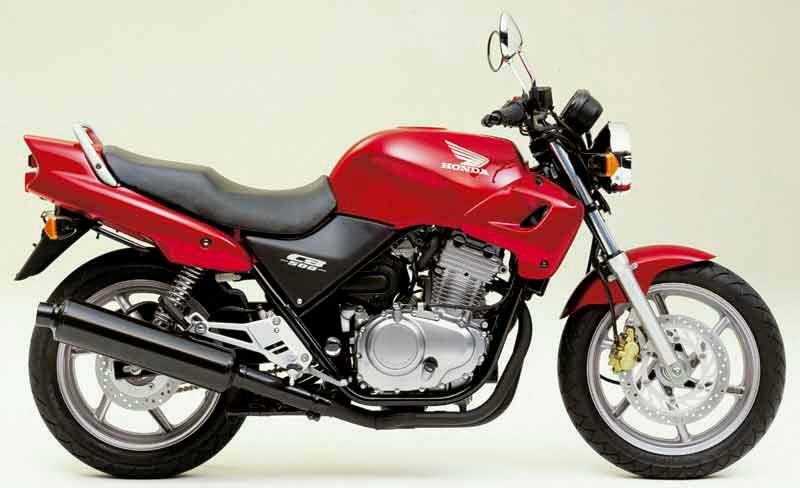 26 owners have reviewed their HONDA CB500 (1994-2003) and rated it in a number of areas. Read what they have to say and what they like and dislike about the bike below. When all the CBRs, ZZRs and Fireblades have gone to the knackers yard, my CB500 will still be tootling about the back roads and twisties... I believe Jesus rides one, I think he got it for Xmas off his dad. Very comfortable indeed, the brakes are more than adequate. Smooth as silk!!! And it has done 96,000 miles !!!! I do my own servicing as the bike is so easy to work on!! I put a bagster tank cover on with tank bag and threw some panniers over, heated grips, job done! I bought the bike off my mate's dad for £800 8 years ago !! Best investment I’ve ever made. enough power for trafficking of any kind even Autobahn, but needs to be revved above 6000 for fun and above 8000 for funfun, only mediocre performance at low revs, but it does have a good and precise gearbox! My first bike, had it for 6 years not, not planning to sell yet. Must learn how to wheelie with it first. Rusts with time, but it's what to expect from a 21 year old bike. Needs some work to get it running smoothly every now and then. Perfect for short riders and women as it is low and light. Extremely comfortable on long trips, can ride 600 km on one day easily. With pillion a bit more tiring as it's a small bike. Pillion loves the wide and soft seat. Takes curves like a dream (my curves were faster than Ducati monster and Suzuki gsxr750). Back brakes are still drum, but stops with decent time. As the years go by, I find harder to buy original new parts for the bike. Some parts are not made by Honda any more and are not available in warehouse either. But a lot of them available as second hand parts. I like that it's low. I'm only 1,62 cm and it suits me well. I use Kappa 2 helmet size top case, a bit big with wind but OK even with pillion on back. Handlebar could be wider. Superb bike, so cheap to run ,milage 200,000 miles no problems just change the oils 120mph just keeps on going. Just coming up to 100 000 miles and still going strong with over 7 000 miles ridden this year so far. 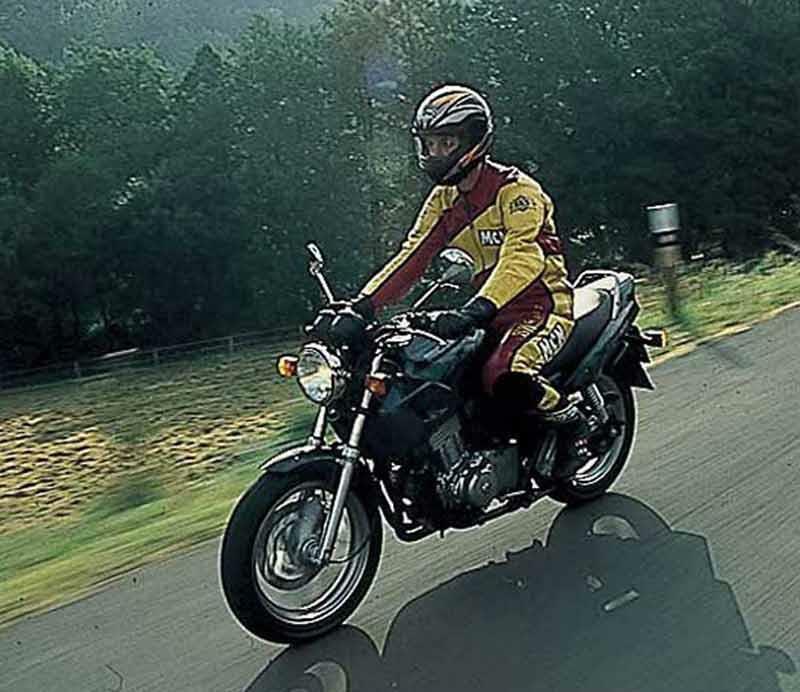 Everything about the bike is perfect for me, the other bikes I have owned at the same time as the CB [955i Speed Triple, 900 Hornet, XJR1300, CB500X and Gladius] are at best 4/5 compared with the CB500s 5/5. The handling will see off bigger bikes around the twisties where they can't get 200 bhp down without a trip to casualty and don't turn as fast. Low speed lock-to-lock figures of eight are easy to achieve. I've ridden just under 900 miles in a day in the past, these days 500 miles/day is about the most I do. 2-3 hours between breaks is easily achievable if you are used to distance riding. Brakes are strong with the front good enough to 'stoppie' the bike and plenty of feel. The front judders before it locks. More power is always welcome, but 57 BHP at the crank will see the bike into cruising at speeds frowned upon. Low RPM riding is easy and a 'change at 8' acceleration gives 0-60 in about 5 seconds. Ignore the 'test' mpg, in the real world and with big miles on the clock the bike returns between 60 and 75 mpg unless thrashed everwhere you go when it will drop to high 50s. The only failures I've had are the reg/rect at 60 000 and the water pump having a bit of a dribble at 99 000. As with any bike ridden in all weathers there are bits of corrosion but my CB500X had a rotten frame after 11 days and 1000 miles of riding. I service the bike myself apart from the valves due to lack of room and bench. The shims haven't been changed from new. Oil and filter changes are a doddle and there's not much else to do. If you want tacho, speedo and a couple of warning lights then that's what you get. If you want a BMW level of buttons and displays you won't get it, but then you don't pay the BMW premium, service prices or accessory prices. The review states that the forks are adjustable [they aren't] but they don't need to be. The rear shocks needed the 'one click higher' setting for me to be happy on the bike. BT45s are the ideal tyre and allow hero blob damage. If your riding style is "not plodding" the front may triangle rather than square off with the wear appearing either side of the centre and the tread blocks stepping as the tyre nears it's worn limit. I have heated grips, 45L cases, luggage rack and a sat nav on mile. The underseat storage contains lock, first aid kit, puncture repair kit, puck, lock, cable repair kit and other tat that you won't fit on a monoshock bike. Great first bike, big enough to put a nice sized box on the back for work gear etc. First bike & compared to the couple I did my basic training on it's really confidence inspiring. Always seem to have power there for you & if you really rev it there is a surprising boot at higher revs. Pretty clean bike, only work to be done was to rub down the rear foot rests as they were corroding a bit, & the speedo gear in the front wheel was broken. Not had it serviced yet, but getting 40mpg in mainly city riding. I had the seat reshaped which reduced the ride height by approx 1.5inches, & it feels much better, even seems to ride better. I stuck on additional LED spotlights 'cos I felt it could be a bit more visible on the road (I'm in the city a lot so any extra helps) Also changed to mirrors to more 'sporty' looking ones. Bought privately through a mate. €1600 in 2015. I bought this bike as my first "big bike" (Thanks eu licence restrictions) Overall the bike is great! I bought mine for £1200 and fitted a few extra's such as heated grips and a full luggage system. I'm currently averaging at least 250 miles each week and the only part that lets the bike down is the organic bit that sits on it (me)! So far I've put on about 5K miles in the last 4 months and she hasn't missed a beat. Overall I'll never have any intentions to sell this bike. The brembo calipers front and back do an amazing job at stopping the bike. It's even more noticeable when there is a pillion on the back. Very good on fuel apparently 45-60mpg is what I've had out of mine but I've been used to a 125 that does 120mpg so my view will be different to most. At less than 10 pence a mile I can't really complain. Engine mounting bolt seizes to the engine and can be difficult to remove but that's my only complaint. I brought my Honda CB500 last year for £1200, and with only 6k on the clock it was an absolute bargain because over 50k miles is pretty normal! So far I've used it for both work and fun on the weekends and its not had a single problem. Its a great first big bike or just a great bike in general. The performance is good and it handles very well. I personally like the brakes because they are very linear and strong when you want them to be. Handling is very good in all conditions and servicing is easy for anyone. I've had it a year and I'm not even thinking of upgrading because its so good for my commute and so reliable. Brembo brakes are very strong and linear. Easy to service so do it myself. Probably looking at between 60 and 150 depending on if you need chain and sprockets or brake pads ect, but parts are very cheap and easily obtained. No fuel gauge, which doesn't really bother me but might annoy some. The storage under the seat is huge! Also having a center stand makes servicing easy work. It a bird, its a plane ITSS the Honda CB500!! Superb 500. The best I have ever ridden. Really responsive, very easy to manage, all in all a really great all round bike. Bike is great around town and on fast A roads. Good for scratching around bends. Reasonable on motorway - up to 80mph. Pulls like a train all the way up to 80. Bit hard work after this. But very smooth considering its a twin. Consumables are very reasonable, very easy to obtain - but buy the very best you can afford. Do not scrimp on things like oil and filter. Very comfy seat, handlebars are spot on, clocks nice and big. Purchased privately. Paid good money - but very, very good example. This bike is a brilliant all rounder that is really rewarding to ride - it has great performance at 'real' roadspeeds and the twin engine is really torquey making it feel a lot more powerful than it would suggest on the engine spec - it really flys once you get the revs up! I have loved every minute of riding it whether commuting/fast A road riding, even camping trips - it can keep up with all but the fastest bikes if you really give it some and the handling is great. My only criticisms are suspension is a bit bog standard which comes to light on rougher roads, and it is a bit too lightweight for very long distances and sustained highspeed riding ie motorways - its a bit vibey at high speed plus light front end, say over 85mph. my first recommendations are: get a givi screen and a tail rack plus heated grips and it'll really work all year round in any conditions, I easily get 55-60mpg (sometimes higher) even when riding fast/mixed conditions which gets over 200miles before hitting reserve. if you need a cheap bike to do it all and not ever let you down get one of these, you'll not regret it - the scores of london couriers who use them can't be wrong!! my only other comment is what a shame they stopped making them.. I bought this bike after five years away after a big accident. I love it and cant bring myself to trade it in for something bigger. Had it for three happy years now. Its fast enough for the streets of London. The engine is smooth and powerful enough to comfortably cruise at 90mph on the motorway. I have had it up to 120mph but this is not its forte. Much better to take the A roads and enjoy the corners. 200 miles to a tank. Above 8000rpm it can move along nicely and can surprise a few other bikers when they haven't shaken you. Others of course fly on by! I ride this thing come rain, hail or snow. It always starts, never breaks, tough as nails. The alloy on the engine is corroding due to the year round riding. I wash is about once a couple of months so am definitely not religious about it. The bike is 14 years old now so its gotta show a few signs of age for a year round bike hey!? Suspension has its limits but have replaced the front springs and oil to stiffen it up as well as replaced the crappy Hagon shock someone put on it. Bought it for £1250 three years ago with 10k on the clock. Cost £110 a year for insurance. It just doesn't make sense to get rid of this little beast! Absolutely love this bike, it hardly breaks, and if it ever does you can guarantee that you (the rider) is most likely to blame. The bike is so forgiving, if you thrash it about it just gets on with it. MPG is brill, even in heavy traffic. I have taken this bike two up touring (with all camping gear) into the alps and it has been completely reliable. I use it for a 100 mile round trip commute twice a week in all weather and to bust traffic in London. It is cheap to run, enough fun on smaller roads to make you grin and holds its value very well, there are always people wanting one after their test. BT45s are the best tyres for it. Frequent oil changes will see the engine last forever. 180 miles / tank cheap spare parts cheap insurance cheap servicing loads of mpg BUT I still can't wait to get a bigger bike after 5 years! I bought this bike as my first big bike, like so many others. It's brilliant! I've done 15000miles on it and its only done just over 480000! Seen some people with over 100,000 "!"""!!! Best tyres I have found to be are bridgestones bt 45's. It's so trouble free only gotta replace the clutch cable but tht can wait and i like to race the couriers lol I can beat most :). It's been to bout 140 and I've got 130 with my mate on the back on the motorway. 0-60 I've had it over in less than 5. I love it and can't wait to get a cbr600f next April. Strengths: Engine its a Honda!. Petrol consumption is wicked, at least 50mpg or bout 100miles per £10. Weaknesses: The brakes could be a bit better, but better than my old 250 wetdream lol. I bought my CB500s the day after I passed my test. I did think about getting a 600 but common sense kicked in and I parted my cash and bought it. After a year's ownership I haven't looked back, it's economical, servicing is cheap and it's mega reliable. OK, it's not the fastest bike in the world but for a 500cc it's great. I've shocked some bigger bikes quite a few times! I've never had any problems with it. It's fun to ride and a great bike to learn your skills on as it's really forgiving. I recommend it to anyone! Strengths: It's fast for what it is, economical, reliable, brilliant bike. Weaknesses: Brakes could be a bit sharper (but they're fine) Gearbox is a bit clunky in 1st and second. Great introduction to larger bikes. Easy to learn and very forgiving. Quick enough round town and M/ways, nippy on the twisty stuff too with gr8 handling. Feels like its never going to trip you up other than a slight run in with some black ice and a mini roundabout. Brakes could be better. Corrosion on downpipes is a bit quicker than expected although it was ridden all thru' winter. Buy one !! First bike since passing my test. Good solid handling machine, found this out during my bike training course with MAC. Good powerband. A bit blustery at the higher speeds requiring you to hang on. This is my first proper bike and it is excellent. It handles well. The only thing I dont like is the exhaust.  I think I will change this in the future. I bought this bike as my company vehicle and as such it was used for eight months commuting to and from Macclesfield to Milton Keynes (250 mile round trip). With a weeks worth of clothes in the topbox and a laptop bungeed to the seat . The bike did suffer power wise on the bends and twists - but once on the motorway it was fine. Cruising at any speed between 70-100 is no problem and gives over 55 MPG. The only (big) problem I find with this, is severe hand numbing vibration - tightening the bar ends didn't have any effect. It's a great bike to ride in the wet (and snow) as the power in both quantity and delivery is very mellow, while the handling is great. The finish isn't great, but regular spraying with WD40 seems to keep most of the corrosion at bay. I don't really use the bike for 'fun' as I also own a Triumph Speed Triple, but the CB is great around less than perfect, bumpy little lanes and is probably faster than my Triumph in quite a few situations (don't tell anyone..). Easy predictable handling and power is often overlooked these days in the pursuit of power, but it's these very traits that make some bikes a lot quicker round the bends than their spec says they should be. The CB is one of these... It would be good to see the CB updated with a CC/Power Increase and maybe a more protective fairing - but I guess this is then getting into Deauville territory? Feels very stable, very reliable. Has just about enough oomph with no passenger on board. fuel efficient, cheap to insure. Not enough oomph, especially with a passenger. Jittery engine at low revs. Very reliable bike, toured abroad (France) and in Southern Ireland on it. The finish holds up well if you look after it during the winter although I have had a new exhaust under warranty after the paint started flaking off it. The mirrors and vibration are the only problem. OK for day to day work and I can scratch with the best of them on track days but if you're touring then it becomes a pain. That is only if you're doing 500 or so miles a day. Perfect for riding all year round any weather bike . Has been 100% reliable despite having a noisy gearbox, hasn't got any worse in 3 years though. Had a new cam chain tensioner at 12000 miles (common fault I've been told). I do all own servicing no problems at all. Only wish I had a faired one. Smashing little bike.Will commute all week and then stay with the fast bikes on the twisties with the bike club at the week-end. Loves to rev and the real action lives above 5000 to the redline (10,500) with a little additional powerband at 8000rpm. Corners with real confidence and screams when overtaking at speed. The seat is comfy for 100 miles at a time and fuel is required after 170 miles or reserve chimes in. Being a twin there is a little vibration but this is minimal and gives a bit of character. To sum up a cheap really good all rounder and quite exclusive-a well kept secret. "Does everything you can ask in a novice-friendly package"
"A straightforward, parallel-twin, middleweight commuter"
A2-licence friendly, unique, fun and good value too!